I would like to put forward a suggestion that as we continue to improve ArcGIS Pro, that we also move to incorporate Business Analyst (and all of its tools) into the ArcGIS Pro platform. Currently I am unable to fully transfer my workflow from ArcMap to ArcGIS Pro because I use Business Analyst for many of my daily job duties, and it is too cumbersome to have to run a BA tool in ArcMap and then load the data in Pro. I am sure you already have plans to incorporate BA into Pro as users transition out of 32-bit ArcMap and into the much faster and powerful 64-bit Pro. The 64-bit environment is able to load, run and render the large demographic datasets that come with BA much more efficiently as well. It would be nice to have this functionality added sooner than later. Thank you for submitting this idea. Could you elaborate on some of the workflows or use cases you are looking to migrate over to Pro? When supporting this idea, please consider commenting to help us better understand what workflows are important to your organization that you would like to carry out in Pro. Hi Scott, thanks for your reply. I am a GIS Analyst for a healthcare consulting company. In addition to the vast and wonderful demographic data we get from ESRI as part of BA Desktop maintenance, we also use a variety of other third-party healthcare data sources within Business Analyst Desktop which we import through the custom BDS layer tool. Among the uses I have for Business Analyst, the main ones are importing our third party healthcare and client patient data into BDS layers, so I can aggregate those data (and combine it with the ESRI demographic data) across custom geographies (such as drive times, or customer derived trade areas) or run certain BA tools. For this, the weighted block group centroid aggregation method within BA (spatial overlay) is irreplaceable, and helps me aggregate most of the healthcare data we get (which is by zipcode) to any geography I would like. Other uses for Business Analyst are the custom reports, which are used to incorporate third party and demographic data into one report. We then export the raw data from the report into excel which we use to create custom charts, graphs and graphics. We have found that the charts within BA are very limited in their customization and style-ability. We like to have our charts match per our company brand-so we use excel for all of the chart and table design, and paste the raw report data into a custom excel template that we have developed. We also use tools such as spider diagram, huff model, mean center, etc. On the cartography side of things, I have found that Pro is a much better cartography platform than ArcMap. This is mainly due to the increased support for anti-aliased display, and most of all, 64-bit architecture. I have currently moved to using Pro for all of my cartographic outputs, and have found that to be quite superior to ArcMap. Many times however, I need to modify my maps in Adobe Illustrator, and Pro (as you may or may not know), doesn't not have the Export to Illustrator functionality that ArcMap previously had. Therefore, there are times when I need to export to Illustrator out of ArcMap in order to have the level of cartographic customization that I need - as a sidebar to the BA coversation - I would strongly encourage ESRI to add this functionality to Pro. ArcMap, being a 32-bit application, has a lot of limitations. Not only am I typically loading multiple copies of the full block-group level demographic data, but I am also using a custom designed basemap that was derived from the basemap data included with Business Analyst Desktop. That puts a lot of strain on the old 32-bit ArcMap, both from a crashing (out of memory) perspective, but also from a display speed perspective (efficiency in my work). I have found Pro to be superior in both regards because it can maximize the full resources of my desktop and display data more quickly and export those data into maps. So to summarize, I am doing much/most of my analysis work in ArcMap, and all of my cartographic work in Pro. Bringing all of these Business Analyst features under one application would really make my life a lot easier for all of the reasons listed above. Although Pro can sometimes be a bit more clunky, I think as time goes on and Pro gets refined (and assuming we can get BA desktop for Pro), I can see myself being able to fully transfer my entire workflow over. In addition, BDS layers from Business Analyst cannot be loaded in Pro, so I need to load those in ArcMap and export to feature class in order to get them into Pro (applies to business/demographic/custom bds layers). BAO is great for your amature GIS user/small business owner, but for the level of GIS work that I do, it feels like BAO is basically a "lite" version of BA Desktop. Other issues are the speed and efficiency of working in a remote/browser setting, the ability to fully customize symbologies, full analysis tools/capabilities, control over labels and the ability to export maps to Adobe Illustrator (also missing from Pro as previously mentioned). In addition to those baseline issues, we also need to consider HIPAA regulations for our client's patient data and keep those data secure (my desktop computer uses an encrypted hard drive). Having this data up on the cloud would be problematic from a HIPAA compliance perspective (although we are investigating options for having our own encrypted GIS server). Because of these considerations, BA desktop is the preferred platform for the GIS work that I do. Thanks for your time in reading this giant wall-o-text! I work for a dental association in California. We also get patient/customer files on our end. What types of analysis do you do? We created patient footprints, identify competition, look at $ spend on dental services, % who have insurance, visited dentist in the past 12 months, age income profiles and more. What type of work do you do on your end? We use BA to accomplish all of the things mentioned above. I do not use PRO yet. Want to brainstorm, share generic maps sometime? Sounds like we do some similar work! I think my contact information (email) is in my profile-feel free to reach out! If you could email a map straight from Pro to a team member that would save me a step (like a gmail or Microsoft extension). Business Analyst is planned to be included in a future release of Pro, towards the end of 2017. This will be an incremental process, so we are looking for more input from the community. Please share your common workflows and uses of Business Analyst currently in ArcMap, and what your "wish list" is for when it is available in Pro. Be descriptive, and let us know what you want or need the most! 5) Export to Adobe Illustrator format (not a BA feature per say, but still functionality that is needed for clean, business-friendly cartographic outputs - PDF's simply don't cut it and are way to cumbersome to use in Illustrator). This was present in ArcMap (and worked wonderfully) but is missing in Pro??? 6) Desire Lines/Spider Diagrams (lets me determine the drive time/drive distance/euclidean distance for each customer associated with a store location - desire lines conveniently calculates this for me and is very helpful). Hi Tyler - thanks very much for outlining your workflows and needs. I will discuss this with the team and our Product Manager, Tony Howser. If it's OK with you, we'll contact you to follow up. 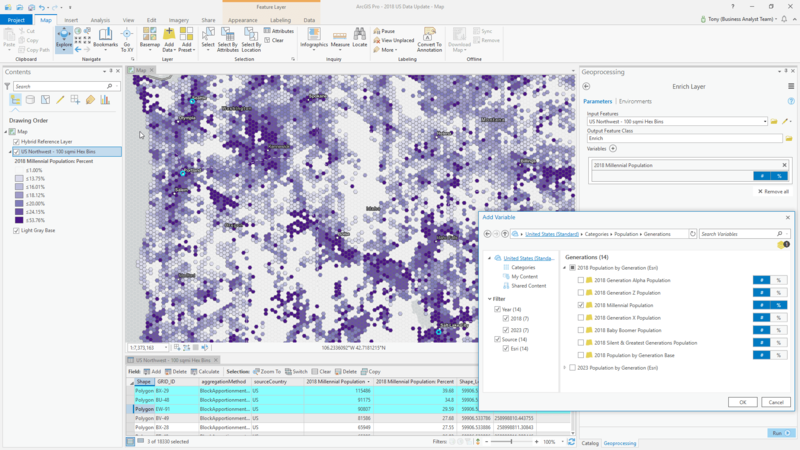 ESRI demographics and being able to use Business Analyst desktop to run BA Analyses and spatial overlays using custom geographies to get demographic breakdowns and create maps using those demographics is a major part of my business, along with Drive Times. One of the biggest reasons I am not using Pro right now is my reliance on Business Analyst Desktop. And to parrot a previous comment, using Business Analyst Online is like using Business Analyst Lite. It just doesn't do what I need to do and if I try, it just eats up too many credits, and I need to be able to export the data easily on the back end to Excel or other formats. That and geocoding millions of addresses. So, BAO is just not an option. BA Desktop is a necessity. So, until it can be used with Pro, I'm in ArcMap 100% of the time. Business Analyst Comes to ArcGIS Pro! Great news! Can't wait to incorporate this into my work. Thanks for posting this blog link Joseph! As outlined in the blog above, Business Analyst has been introduced in ArcGIS Pro 2.1. This is not meant to introduce all functionality that you're used to consuming in Business Analyst Desktop, but it is just the beginning. This blog will give you an idea of what is included in this first release. Don't worry! We will continue to add more BA functionality in ArcGIS Pro as time goes on. If you are currently using BA Desktop and don't see your usual tools mentioned in these blogs, let us know! Feel free to submit a new idea outlining which functionality you need, and give us a brief understanding of how you use this in your day-to-day projects. Business Analyst Extension is greyed out in ArcGIS Pro 2.1 Basic (named user license). I am running ArcMap Desktop Basic 10.5 and it runs the Business Analyst Desktop Standard extension fine, but for some reason its not allowing me to enable it in Pro - anyone have any ideas? Since this idea has been "Partially Implemented", please consider creating new ideas for specific Business Analyst functionality you'd like to see in ArcGIS Pro. Also, please consider joining the Business Analyst group to ask questions, discuss the product with the team, and get all of your up-to-date information about Business Analyst. Just to add onto what Scott mentioned... We typically leverage your feedback to prioritize features and capabilities in our release roadmap so, any Ideas you provide would be greatly appreciated. 1) BDS layer support (so I can import third party data, overlay it to some trade area, and then export it through reports) - unless there is a better way to do this without BDS layers? Now would also be a great time to refine the report builder interface to be both more intuitive and customizable, especially with charts (excel still blows you guys out of the water, which is why I currently export data out of reports and import into excel to build my charts and tables). Thank you for quickly responding with your great feedback! Please see below and thank you for being a valued user of our products! BDS layer support (so I can import third party data, overlay it to some trade area, and then export it through reports) - unless there is a better way to do this without BDS layers? We are planning on introducing the next-generation version of what is currently known (in our ArcMap extension) as BDS’s to our newer ArcGIS Pro extension offering. This newer workflow is known as Custom Data Setup and is a powerful option for working with third-party or “custom” datasets alongside Esri’s data in GeoEnrichment and Business Analyst-based mapping, reporting, and analytics. The workflow to set up “custom data” is faster, easier, and more streamlined. It will support not only "" content & services (e.g. [ArcGIS ] or [BA Server + ArcGIS Enterprise]) but will also support disconnected/offline usage through ArcGIS Pro (supported by locally-installed data, of course). We hope to introduce this with the next major ArcGIS Pro release (2.3) in the Q1 2019 timeframe. We are always looking to enhance our existing tools and workflows. We are definitely exploring options that leverage “granular” and complementary tools such as those in the Network Analysis toolbox in BA-based workflows. Generally speaking, our current strategy is to limit completely recreating existing tools and functionality already available to Business Analyst users of ArcGIS Pro (see list below) and instead leverage these capabilities---where it makes sense---to enhance our existing BA-based tools and workflows. We are always exploring options to streamline advanced workflows and enhance them with useful options based on user needs and business requirements so thank you for this. ArcGIS Pro is wonderful in that its modern and high performance architecture enable us to do a lot of new stuff (see screen captures below) and do existing stuff even better and faster. With respect to “reports”, have you seen what is possible with our custom Infographic capabilities? 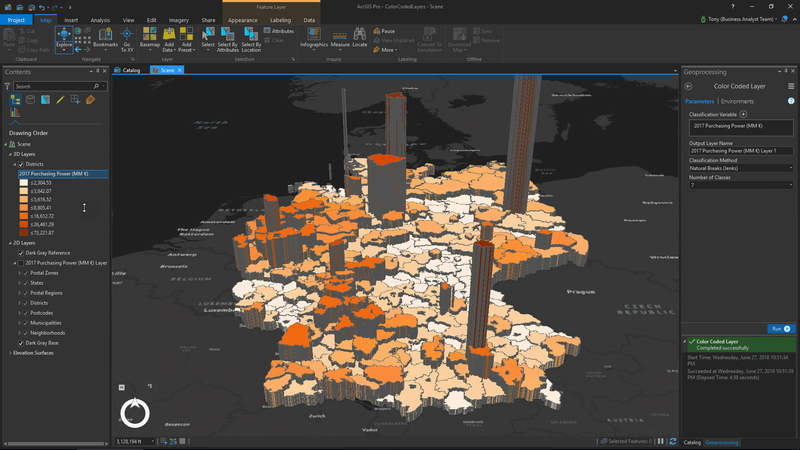 This newer Business Analyst-based reporting capability is supported by the GeoEnrichment Service and dynamically summarizes information about businesses, households, and populations based on user-defined queries of places or areas via highly-visual, modern, data-driven, and interactive dashboard-like views. Think of Infographics as a very modern and engaging form of reporting. We hope to introduce support for Infographics at the next major ArcGIS Pro release (2.3) in the Q1 2019 timeframe. This is great, thanks for sharing. Glad to see there is a lot of work being done on the Pro Business Analyst front. In terms of the custom infographics, that is a tool I have explored but have determined it isnt going to be highly useful. The reason being is that most 1) of our consulting services require hard copies to be delivered to our clients and 2) BAO does not have the needed level of advanced tools and customization (especially with infographics) that we need for our organization. Yes you can add a chart or infographic, but its still all within an ESRI based interface (and also ). 3) We do not use BAO because BA Desktop allows for much greater capabilities. For that reason, our workflow works best when we export the data directly out of a report through desktop, and import that data into excel/tableau for custom chart and table creation. There just isnt enough customization and capability with the '' version of Business Analyst and for that reason we just dont use it. 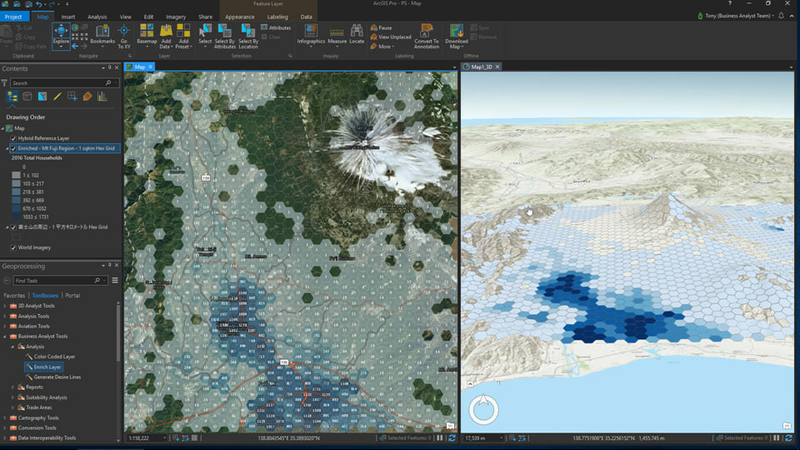 Its a great tool for a non-GIS professional who needs to dabble with GIS to do some Business Intelligence work, but for pure GIS-focused analysts, its just not as diverse or offer the same tools and capabilities as BA Desktop (or ArcMap/ArcGIS Pro). I would like to push ESRI to continue to develop Business Analyst Desktop. I know there has been a greater shift to moving these tools ... Again BAO is great for your non-GIS professionals/users (Business Intell analysts without a heavy GIS background) but for those of us more focused in GIS, the traditional desktop-based analysis is where we are going to be staying for quite some time. At the end of the day our deliverables still take the form of a powerpoint or pdf hardcopy and ArcGIS , story maps, and BAO just doesn't fit into our required deliverables when clients expect hard copies. We also need to add to the fact that our organization uses HIPAA data and uploading these data to the cloud for analysis in either BAO or AGO isnt feasible from a security perspective. That said, this was a wonderfully informative post, thank you! Thank you for your continued feedback. These are very valuable. I am curious to learn more about your feedback below related to infographics. What are the specific infographic customization capabilities that you are looking for to help make the infographics that your organization needs? Also, what are some export formats in addition to the currently existing PDF and Image options that can help get the hard copies that your clients need? Let me know if you have any questions or additional feedback on infographics. I will admit that I have not played with the infographics tool in a while, but the main issue is the ability to create customized charts such as combined bar and line charts, stacked bar charts, customized pie charts (with an offset pie piece and perhaps some callout text) and custom fonts. Furthermore, since this all needs to be done with data that is available on the cloud, there is specific data that we cannot plug into these tools, such as HIPAA data and third party data. And finally, many times we are taking data and running analysis in excel (for instance forcasting certain data out into the future) and then putting that into a chart - I am not aware of how we can do that using ESRI's infographics tool. The primary shortcoming is that all the data needs to be on the cloud. I need it on my desktop. Finally, if I do everything with BAO I get charged an immense amount of credits which makes no sense because I can do everything much more efficiently on desktop, I can keep my data organized in geodatabases (I can control my data), and I can run many more tools and custom models (using tools outside of BA as well), and again, dont get charged credits for everything. BAO just isnt at the level that GIS profressionals need, and therefore the infographics which is part of BAO just isnt feasible. Its great for BI analysts or non-power gis users, but for those of us that are, BA Desktop is the preferred choice unfortunately. I will say, if ESRI decides to build an infographics tool that runs on the desktop and allows for local data, I would give it a very serious look and would likely try to integrate it into my workflow in some way... but need the ability to create complex charts, control fonts, transparencies, be able to move and adjust data labels, legends, tick marks, etc. Thank you for your great feedback. I agree that in many cases BA Desktop is the preferred choice. However, I wanted to make sure that you are aware of BA Web App (aka BAO) being available on-premises with BA Server which can address the need for not having to host your data in a third party cloud as well as concerns with credits. If you are interested, I will be happy to have an meeting with you to discuss your feedback and show you how the Business Analyst architecture works on-premises. I think it might help your use cases. Again, thanks for your continued feedback. This is very helpful for us.